It's been nearly a century and a half since steel replaced wood as the primary material of ships, bridges and other large infrastructure manufactured by the developed world. By the early 20th century, steel constructs like the locomotive and the skyscraper had become symbols of the Industrial Revolution and testaments to human ingenuity. But progress is not always linear -- sometimes, it doubles back. Today a small but committed cadre of architects, firms and government agencies are re-examining the case for wood as a building material and finding it not just feasible, but perhaps more sustainable than conventional materials. "The adoption of concrete and steel revolutionized every city on Earth, but for a hundred years there's been no real alternative," said Michael Green, an architect and author who designs and advocates for tall wood infrastructure. "Now we've got one that's grown by the sun, sequesters carbon and holds up just as well. That generated an overwhelming amount of curiosity about what we can do with wood." Wood is, of course, already a primary building material for small structures in the United States and elsewhere. But Green and his fellow advocates are looking further ahead to a more densely populated, urbanized future. They believe that wood could play a major role in building the large infrastructure, high-rises and even skyscrapers on which future populations rely. Beyond the intellectual challenges it offers to architects, there's a powerful climate argument behind expanding the role of wood, advocates say. "It's an argument in two parts," said Chad Oliver, director of the Global Institute of Sustainable Forestry at the Yale School of Forestry & Environmental Studies (F&ES). "First, when you build with wood, you're storing carbon" -- which counts for about half of wood's dry weight -- "away for a long time." Assuming new trees grow to replace those that have been harvested, that's a net carbon reduction, he said. But the more compelling climate case is that wood could offset concrete and steel, both of which heavily contribute to global greenhouse gas emissions, he said. Manufacturing the latter materials requires a lot of energy. Estimates by F&ES put the annual energy costs of steel, concrete and brick at 16 percent of total global fossil fuel consumption. The manufacture of cement, the primary ingredient in concrete, accounts for about 5 percent of annual global greenhouse gas emissions; manufacturing steel has a similar footprint. And with huge infrastructural build-outs expected over the coming decades, the greenhouse gas footprint from these industries could be massive, Oliver said. "Of all the infrastructure we're going to need by 2050, only about 35 percent exists today," he said. "That means almost twice as much has yet to be built. What are we going to build it out of?" These questions could have serious consequences for the climate, he added. Much of the new push for wood in large buildings has its genesis in Austria, where timber has always been a major industry. Even more so than in the United States, however, concrete and steel dominate Austrian residential architecture, forcing the wood industry to find new applications for its product. 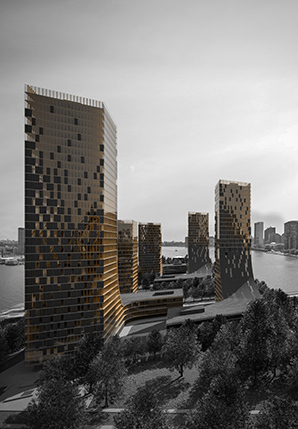 An artist's concept of what wood-built high-rise buildings might look like on New York City's Roosevelt Island. Photo courtesy of Michael Green Architecture. One solution, developed in the mid-1990s, was a product called cross-laminated timber (CLT) -- essentially low-to-medium-grade dry timber, stacked at right angles and glued. Because the grains of the individual pieces are set against each other, CLT can resist pressure from all sides and can be fabricated to any specified dimensions. CLT was originally created for business purposes but was quickly seized on by Green and other architects who recognized its potential ecological benefits. Coinciding with the emergence of CLT, the Canadian province of British Columbia had been hit with the worst outbreak of mountain pine beetles on record, and the architects saw the new product as a possible use for the millions of beetle-killed trees that might otherwise decompose and become a carbon source. "To some extent you could argue that it was climate change itself that triggered the push for tall wood buildings," Green explained. Can you save the forest for the trees? As a carbon sink, the world's forests are invaluable. Annual forest growth sequesters around 4 gigatons of carbon every year, while the total amount of carbon stocked in Earth's forest cover is estimated at 1,200 gigatons -- about twice the levels present in the atmosphere. It might seem counterintuitive, then, to push for increased harvest as a way to fight climate change. But the vast majority of trees lost each year aren't harvested for timber products but are cleared to make room for agriculture or burned as a low-efficiency fuel source. Oliver, who led a recent study on the life cycle analysis of wood as a building material, said that forest regrowth far outpaces the needs of the timber industry. Harvesting wood for products offsets about 20 percent of annual forest growth, he said. Far more forest is lost to agricultural development -- so much so that deforestation accounts for about a quarter of the world's net carbon surplus. "Harvesting more wood could actually strengthen the argument for biodiversity," he said. "We need to appreciate the resource and protect it." Sustainable forest management practices that targeted younger, smaller trees could even contribute to forest health, he said, as many U.S. forests are currently overgrown. The analysis found that between 14 and 31 percent of global greenhouse gas emissions could be avoided by increasing the use of wood in buildings and infrastructure, both by sequestering carbon and offsetting the production of other materials. But even given new technologies, can wood really replace steel to hold up structures weighing thousands or even hundreds of thousands of tons? Rather than build solely out of wood, the idea right now is to expand the role of wood in mixed-material buildings, said Jim Bowyer, director of the Responsible Materials Program at Dovetail Partners Inc.
"You can imagine a building whose foundations are concrete and steel, with six, seven or 10 stories of wood above that," he said. The foundations for such a building wouldn't need to be so massive, either, because wood weighs less than other materials, he added. In fact, a number of buildings already exist -- in Austria, London, Australia and Canada, among others -- whose internal skeletons are primarily wood. While these projects have been one-offs, they do demonstrate a proof of concept, Bowyer said. In the United States, several firms and the U.S. Forest Service have pushed to expand the role of wood in construction. The Forest Service has released a number of studies detailing the environmental benefits of using wood in buildings and recently launched a design challenge for buildings incorporating wood. Building codes, however, are slow to advance, meaning the use of wood as a material in multistory buildings is still several years away from approval, experts say. Building codes are designed to evolve slowly with lag times of three years for proposed changes to the code to come into effect and more time after that to see adopted changes implemented.